The clinical features of orbital cellulitis included proptosis, swelling of the eyelids, conjunctival chemosis, and limited ocular motility. There may be exposure keratopathy resulting in corneal ulceration. The vast majority of these patients present with local symptoms such as edema, erythema, pain, chemosis, decreased ocular motility, and proptosis [Figure 1]. To differentiate between more superficial infections and orbital cellulitis, signs, and symptoms resulting from inflammation may be helpful. Specifically, the incidences of decreased visual acuity, proptosis and external ophthalmoplegia are more closely associated to orbital cellulitis. Temperature greater than 37.5°C and leukocytosis resulting in fever is a more prominent feature in the pediatric group. External ophthalmoplegia and proptosis may be the most common features, while decreased visual acuity and chemosis may be less frequent in pediatric cases as well as in adults. Involvement of the optic nerve may produce papilledema or neuritis with rapidly progressing atrophy resulting in blindness. One factor in determining the atrophy is mechanical pressure. A second is compression of the central retinal and other feeding arteries,  but the orbital inflammation may spread directly into the substance of the nerve with the appearance of small necrotic areas or an abscess. In addition to the infarction of the optic nerve, infarction of the sclera, choroid, and the retina may occur. A septic uveitis, iridocyclitis, or choroiditis with cloudy vitreous, including septic panophthalmitis may develop. Glaucoma may be a rare complication of orbital cellulitis in which case the patient may present with reduction in the visual field or an enlarged blind spot. In some cases, there may be no pathologic evidence in the fundus. Although ultrasonography (U/S) can be useful as an in-office screening procedure in cases of suspected orbital abscesses, CT-scan is necessary to assess the sinuses and intracranial extension. On orbital U/S, orbital abscess may show low internal reflectivity. On CT-scan, one may see a localized, generally homogenous elevation of the periorbita adjacent to an opacified sinus. Imaging studies may show evidence of inflammatory or infective changes in the orbital structures. In the pediatric group, more patients may have subperiosteal abscess as compared to the adult group at the time of initial presentation. For example, in the series reported by Ferguson and McNab,  among children, 29% had inflammatory change only, 62% had a subperiosteal abscess, while only 9% had orbital abscesses, compared with 72%, 5%, and 22%, respectively, in the adult group. In addition to its essential role in the diagnosis of orbital abscess, CT-scan may also influence the initial therapeutic plan by demonstrating the size and location of the abscess and the specific sinuses involved, factors that may be considered if surgical drainage is considered. , However, CT-scan characteristics of subperiosteal collection may not be predictive of the clinical course. For example, the findings in patients who recovered with antibiotic therapy alone were similar to the findings in patients who underwent surgical drainage. It has been shown that the size of an orbital abscess on imaging studies may increase during the first few days of intravenous antibiotics regardless of the bacteriologic response to the treatment. The identification of orbital abcess is a diagnostic challenge. The reliability of CT-scan in demonstrating orbital abcess has been questioned. In a series of 25 cases of orbital infection, all 15 orbital abscesses were satisfactorily demonstrated provided the CT examination included coronal sections. According to this study, one-third of abscesses would have been missed if coronal sections had been omitted. Magnetic resonance imaging (MRI) may be necessary in some cases where CT-scan have not satisfactorily addressed clinician's concerns with other imaging techniques. Commonly reported bacteria from the abscesses of the orbit include Staphylococcus aureus, Staphylococcus epidermidis, Streptococci, Diphtheroids, Haemophilus influenza, Escherichia More Details coli and multiple species including aerobes and anaerobes. No growth in up to 25% of abscesses. The results of microbiological investigation by Ferguson and McNab  varied with differences in the rate of testing between the pediatric age group and the older age group. Some form of culture was performed in 93% of their patients. Among 50% of patients, who had blood cultures performed, none yielded positive results. In their  study, cultures taken from abscesses were more likely to produce positive results. There was no correlation between conjunctival swab cultures and the etiological organism recovered from the abscesses of patients with positive cultures. S. aureus was the most common pathogen. In the pediatric group various species of Streptococcus predominated. Anaerobic Streptococcus was isolated in four pediatric patients, two cases with mixed anaerobes and one with Clostridium bifermentans. Anaerobic orbital cellulitis was much less common in adults, with only one case of mixed anaerobes. Multiple organisms were isolated in only five adults and four pediatric patients. No pathogens were isolated from six adults and 15 pediatric patient by Ferguson and McNab. In the past, H. influenza was a major pathogen responsible for orbital cellulitis in the pediatric age group. , In the series reported by Ferguson and McNab,  no cases of H. influenza were detected in the pediatric age group and only one case was found in an adult patient. The authors  attributed this observation due to the general immunization of children with H. influenza type B vaccine since the early 1990s. Microbes can cause necrotizing lid disease that is often referred as necrotizing fascitis. ,,, This may progress to systemic manifestation including potentially fatal toxic streptococcus syndrome, characterized by multiorgan failure. , These complications can occur in the absence of antecedent health problems or history of trauma. ,, The virulence of this organism is related to the production of M proteins and exotoxins A and B. These proteins act as super-antigens in vitro and mediate tissue necrosis by causing massive release of cytokines such as tumor necrosis factors and interleukins. Surgical treatment is indicated for significant underlying sinus disease, orbital or subperiosteal abscess or both in the pediatric age group. In adults, sinus surgery remains the most common surgical intervention. The argument remains between early drainage of orbital abscess to prevent complications versus the possibility of seeding the infection through early surgery. Harris has outlived a useful approach in the management of an orbital abscess. He recommends emergency drainage for patients of any age, whose visual function is compromised. Urgent drainage, usually within 24 h, is indicated for the following: large orbital abscess causing discomfort, superior or inferior orbital abscess, evidence of intracranial extension, involvement of frontal sinuses, and a known dental source of the infection in patients older than 9 years [Figure 4]. An expectant approach is indicated for patients younger than 9 years with medial subperiosteal abscess of modest size, no visual loss and no intracranial or frontal sinus involvement. Careful evaluation and close monitoring of the optic nerve function and the level of consciousness and mental state of the patient is very important. There are few major complications following treatment of orbital cellulitis. Ferguson and, McNab  reported no loss of vision after resolution of infections. Only one patient from the pediatric age group had proptosis on follow-up; one had ophthalmoplegia and one had recollection of abscess. One of their  adult patients developed presumed meningitis, and another adult patient required enucleation. Permanent loss of vision has been noted as a complication of orbital infection since 1893 and blindness was reported in up to 20% of patients with postseptal inflammation in the preantibiotics era. However, permanent loss of vision resulting from orbital inflammation is unusual in this era of antibiotics. , In a previous study, 4 of 38 patients with postseptal disease had permanent loss of vision with one of these patients progressing to no light perception. The mechanism for loss of vision with orbital inflammation may involve: (1) optic neuritis as a reaction to adjacent or nearby infection; (2) ischemia resulting from thrombophlebitis along the valveless orbital veins or; (3) compressive/pressure ischemia possibly resulting in central artery occlusion. , Because clinical examination by itself may not exactly delineate the nature of postseptal inflammatory processes, clinicians may have to rely on imaging studies to select potential surgical candidates. Despite modern imaging techniques, the clinician must rely on the clinical progression of the inflammation based on visual acuity testing, pupillary reactivity, and ocular motility assessment. Patt and Manning,  reported four cases of permanent blindness as a result of postseptal orbital inflammation. In each case, CT-scan readings of "no definite abscess" contributed to delay in diagnosis of orbital abscess, with a resultant delay in surgical drainage. The ethmoidal sinuses are separated from the orbital contents by the lamina papyracea and anterior and posterior ethmoidal foramina serve as additional connections that may allow infection to gain access from ethmoidal air cells to the orbital contents. The periorbita in this area is loosely attached to bone and may be elevated by a purulent collection, resulting in subperiosteal abscess. Severe irreversible visual loss may occur in cases with orbital and subperiosteal abscess. In a survey of 46 cases with a confirmed diagnosis of orbital and subperiosteal abscess in which visual results were reported, permanent blindness developed in seven (15%) cases. In four cases, blindness was attributed to central retinal artery occlusion, in two cases optic atrophy occurred, and in one case no details were provided. Irreversible visual loss in orbital cellulitis probably has a vascular cause, whereas cases with reversible visual loss that respond to antibiotic therapy and drainage procedures most likely are due to infiltrative or compressive optic neuropathy. The confinement of the optic nerve in the orbital apex and within the bony canal and its proximity to the posterior ethmoid and sphenoid sinuses magnify the importance of the casual factors in posterior orbital cellulitis. Clinicians should be aware that patients with sinusitis and associated orbital cellulitis are at risk for developing severe visual loss and should be treated promptly. Hornblass  reviewed 148 patients from 13 series reporting orbital abscess and found three cases of no light perception vision. Sinus infections appear to be a more common cause of intracranial abscess, the most common being frontal sinus, followed by ethmoid and maxillary sinuses. In the preantibiotic era, Birch-Hirschfeld, reported that 19% of the patients died among the 275 cases of orbital cellulitis studies from 1907-1930 due to the intracranial complications. Hartstein et al. reported case-records of three patients who were found to have pansinusitis progressing to subperiosteal abscess of the orbit and subsequent intracranial abscess. All three patients were treated with intravenous antibiotics and surgical drainage of the orbital abscess and sinuses. Two of the three patients required drainage of the intracranial abscess. Maniglia et al. reported 19 cases of intracranial abscess secondary to mid-face infection, anaerobic organisms being the predominant cause of abscess. These intracranial complications were secondary to nasal, sinus and orbital disease, cavernous sinus thrombosis occurred in only one patient. Frontal lobe, epidural and subdural abscesses were more common. Handler et al. recommend surgical drainage for those with a deterioration of ocular motility and vision. Ethmoid sinusitis was an overwhelming predisposing cause in their study and intracranial spread occurred in 6 of 65 patients with orbital cellulitis. The superior ophthalmic vein drains into the cavernous sinus, the inferior ophthalmic vein, however, may drain either into the cavernous sinus through the superior orbital fissure or into the pterygoid plexus through the inferior orbital fissure. Valveless veins interconnect the orbit with sinuses, eyelids and cavernous sinus. Although rare, intracranial abscess is a life-threatening complication of orbital abscess that may require aggressive intervention by a multidisciplinary team [Figure 5]. Fatal complications of intracranial abscess may result from cavernous sinus thrombosis and intracranial rupture of the abscess. Patient with intracranial abscess may be asymptomatic or present with nausea, vomiting, seizures and change in mental status. Neurological signs of intracranial abscess may include fever or altered mental status [Figure 2]. In the past, intracranial abscess formation had a poor prognosis with a significant mortality rate. The classic neurological presentation of intracranial abscess seen in adults is often subtle. These symptoms can be minimal or absent in children. Cavernous sinus thrombosis represents the most severe form of postseptal cellulitis. Cavernous sinus thrombosis is suspected clinically by bilateral disease with ophthalmoplegia and loss of vision. , Imaging studies are indicated when neurologic signs are present, to rule out associated epidural or subdural empyema, brain abscess, or cavernous sinus thrombosis. ,, MRI with fat suppression can be useful for visualizing the intracranial component in suspected cases. Follow-up imaging studies may be indicated based on the clinical examination. Successful management may include a multidisciplinary team including an oculoplastics surgeon, otolaryntologists, neurosurgeon, and infectious disease expert. 1. Chaudhry IA, Shamsi FA, Elzaridi E, Al-Rashed W, Al-Amri A, Al-Anezi F, et al. 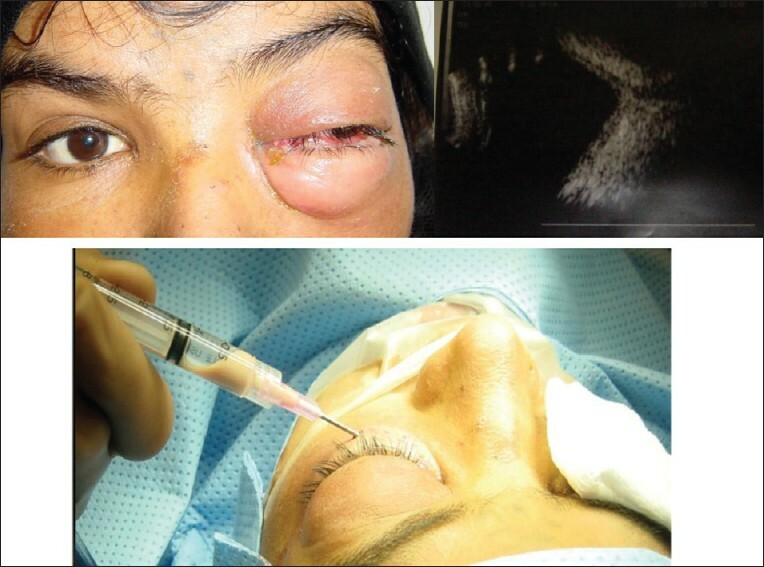 Outcome of treated orbital cellulitis in a tertiary eye care center in the middle East. Ophthalmology 2007;114:345-54. 2. Chaudhry IA, Shamsi FA, Elzaridi E, Al-Rashed W, Al-Amri A, Arat YO. Inpatient preseptal cellulitis: experience from a tertiary eye care centre. Br J Ophthalmol 2008;92:1337-41. 3. Chandler JR, Langenbrunner DJ, Stevens ER. The pathogenesis of orbital complications in acute sinusitis. Laryngoscope 1970;80:1414-28. 4. Maniglia AJ, Goodwin WJ, Arnold JE, Ganz E. Intracranial abscesses secondary to nasal, sinus, and orbital infections in adults and children. Arch Otolaryngol Head Neck Surg 1989;115:1424-9. 5. Ferguson MP, McNab AA. Current treatment and outcome in orbital cellulitis. Aust N Z J Ophthalmol 1999;27:375-9. 6. Duke-Elder S, MacFaul PA. The ocular adnexa: part 2. Lacrimal orbital and para orbital diseases. In: Duke-Elder S, ed. System of Ophthalmology. London: Henry Kimpton; 1974. p. 859-89. 7. Connel B, Kamal Z, McNab AA. Fulminant orbital cellulits with complete loss of vision. Clin Exp Ophthalmol 2001;29:260-1. 8. Jarrett WH, Gutman FA. Ocular complications of infection in the paranasal sinuses. Arch Ophthalmol 1969;81:683-8. 9. Chaudhry IA, Shamsi FA, Morales J. Orbital cellulitis following implantation of aqueous drainage devices for glaucoma. Eur J Ophthalmol 2007;17:136-40. 10. Fezza J, Chaudhry IA, Kwon YH, Grannum E, Sinard J, Wolfley DE. Orbital melanoma presenting as orbital cellulities: A clinicopathologic report. Ophthal Plastic Reconstr Surg 1998;14:286-9. 11. Chaudhry IA. Herpes Zoster Presenting with Orbital Cellulitis, Proptosis, and Ophthalmoplegia. Middle East J Ophthalmol 2006;13:167-9. 12. Krouschnabel EF. Orbital apex syndrome due to sinus infection. Laryngoscope 1974;84:353-71. 13. Hornblass A, Herschorn BJ, Stern K, Grimes C. Orbital abscess. Surv Ophthalmol 1984;29:169-78. 14. Morgan PR, Morrison WV. Complications of frontal and ethmoid sinusitis. Laryngoscope 1980;90:661-6. 15. Fearon B, Edmonds B, Bird R. Orbital-facial complication of sinusitis in children. Laryngoscope 1979;86:947-53. 16. Harris GJ. Subperiosteal abscess of the orbit: age as a factor in the bacteriology and response to treatment. Ophthalmology 1994;101:585-95. 17. Harris GJ. Subperiosteal abscess of the orbit: computed tomography and the clinical course. Ophthal Plast Reconstr Surg 1996;12:1-8. 18. Garcia GJ, Harris GJ. Criteria from nonsurgical management of subperiosteal abscess of the orbit: analysis of outcomes 1988-1998. Ophthalmology 2000;107:1454-8. 19. Harris GJ. Subperiosteal abscess of the orbit: older children and adults require aggressive treatment: Editorial. Ophthal Plast Reconstr Surg 2001;17:395-7. 20. Schramm VL, Myres EN, Kennerdell JS. Orbital complications of acute sinusitis: Evaluation, management and outcome. ORL Digest 1979;86:221-30. 21. Patt BS, Manning SC. Blindness resulting from orbital complications of sinusitis. Otolaryngol Head Neck Surg 1991;104:789-95. 22. Gellady AM, Shulman ST, Ayoub EM. Periorbital and orbital cellulitis in Children. Pediatrics 1978;61:272-7. 23. Watters EC, Waller PH. Acute orbital cellulitis. Arch Ophthalmol 1976;94:785. 24. Weiss A, Friendly D, Eglin K. Bacterial periorbital and orbital cellulitis in childhood. Ophthalmology 1983;90:195-204. 25. Welsh LW, Welsh JJ. Orbital complications of sinus disease. Laryngoscope 1974;84:848-56. 26. Giletto JB, Scherr SA, Mikaelian DO. Orbital complications of acute sinusitis in children. Trans Pa Acad Ophthalmol Otolaryngol 1980;34:60. 27. Smith AT, Spencer JT. Orbital complications resulting from lesions of sinuses. Ann Otol Rhinol Laryngol 1948;57:5. 28. Langham-Brown JJ, Rhys-Williams S. Computed tomography of acute orbital infection: the importance of coronal sections. Clin Radiol 1989;40:471-4. 29. Hilal SK. Computed tomography of the orbit. Ophthalmology 1979;86:864. 30. Donahue SP, Schwartz G. Preseptal and orbital cellulitis in childhood: A changing microbiologic spectrum. Ophthalmology 1998;105:585-95. 31. Ingraham HJ, Ryan ME, Burns JT. Streptococcal preseptal cellulitis complicated by the toxic streptococcus syndrome. Ophthalmology 1994;102:1223-6. 32. Shayegani A, MacFarlane D, Kazim M. Streptococcal gangrene of the eyelids and orbit. Am J Ophthalmol 1995;120:784-92. 33. Marshall DH, Jordan DR, Gilberg SM. Periocular necrotizing fasciitis: a review of five cases. Ophthalmology 1996;104:1857-62. 34. Meyer MA. Streptococcal toxic shock syndrome complicating preseptal cellulitis. Am J Ophthalmol 1996;123:841-3. 35. Bhargava D, Saukhla D, Ganesan A, Chand P. Endoscopic sinus surgery for orbital subperiosteal abscess secondaryto sinusitis. Rhinology 2001;39:151-5. 36. Slavin ML, Glaser J. Acute severe irreversible visual loss with sphenoethmoiditis - 'posterior' orbital cellulitis. Arch Ophthalmol 1987;105:345-8. 37. El-Sayed Y, Al-Muhaimeid H. Acute visual loss in association with sinusitis. J Laryngol Otol 1993;107:840-2. 38. Borruat FX, Bogousslavasky J, Uffer S, Klainguti G, Schatz NJ. Orbital infarction syndrome. Ophthalmology 1993;100:562-8. 39. Hartstein ME, Steinvurzel MD, Choen CP. Intracranial abscess as a complication of subperiosteal abscess of the orbit. Ophthal Plast Reconstr Surg 2001;17:398-403. 40. Handler LC, Davey IC, Hill JC, Lauryssen C. The acute orbit: differentiation of orbital cellulitis from subperiosteal abscess by computerized tomography. Neuroradiology 1991;33:15-8. 41. Giannoni CM, Stewart MG, Alford EL. Intracranial complications of sinusitis. Laryngoscope 1997;107:863-7. 42. Brook I. Bacteriology of intracranial abscess in children. J Neurosurg 1981;54:484-8. 43. Weber AL, Mikuli D. Inflammatory disorders of the periorbital sinuses and their complications. Radiol Clin North Am 1987;25:615-30. 44. Towbin R, Han B, Kaufmann R, Burke M. Postseptal cellulitis: CT in diagnosis and management. Radiology 1986;158:735-7. 45. Harr DL, Quencer RM, Abrams GW. Computed tomography and ultrasound in the evaluation of orbital infection and pseudotumor. Radiology 1982;152:395. 46. Brook I, Frazier EH. Microbiology of subperiosteal orbital abscess and associated maxillary sinusitis. Laryngoscope 1996;106:1010-3.